July 3, 1996: A large crowd of 43,000 came to Veterans Stadium to see Dallas Green's visiting New York Mets (38-45) take on Jim Fregosi's hometown Phillies (34-48). 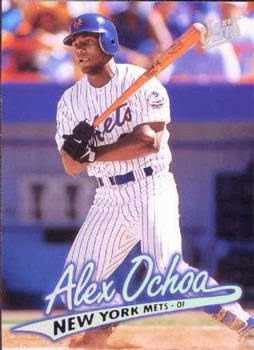 On this day, Mets right fielder Alex Ochoa had a career day, hitting for the cycle with five hits, three RBIs & three runs scored. Ochoa started out with a single in the 2nd inning off starter; Terry Mulholland. In the 4th he added an RBI triple scoring Todd Hundley, putting the Mets up 4-2. In the 6th inning. Ochoa doubled off Mulholland and scored on Butch Huskey's HR, putting the Mets up 6-3. In the 8th, Ochoa hit a solo HR, (his 6th of the year) off Ken Ryan. In the 9th inning, he completed the cycle with a double off pitcher Steve Frey. This scored Jeff Kent with the Mets tenth run of the game. The Mets won the game 10-6 and Alex Ochoa finished the day batting .390. The winning Mets pitcher that day was Paul Byrd who went to 1-1. Doug Henry recorded the save, his sixth of the year. He would have nine on the year, second on the club to John Franco who would save 28 after coming back from injury. 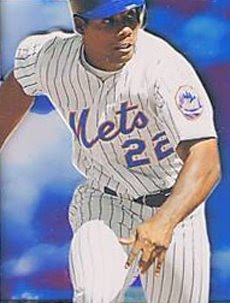 The Mets would finish fourth that year at 71-91, with Bobby Valentine taking over as manager in late August. Can we get some sort of concerted fan effort to get the Mets to go back to their pinstriped uniforms with the blue hats, at the very least, once every homestand?